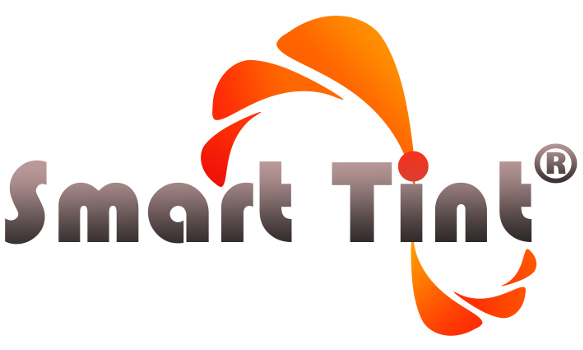 If you would like us to post your Smart Tint® project simply contact us. Here is the photo of the actual Smart Tint® used in these pods from concept to design to conception. We custom build plexi-glass smart tint enclosures to your specifications. 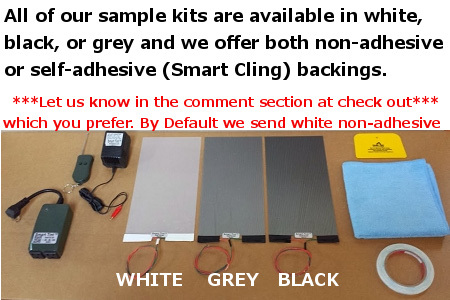 Smart Tint™ offers the STANDARD FROSTED WHITE , PINK(Salmon) , BLUE , GREEN, YELLOW , LIGHT GREY and DARK CHARCOAL GREY! Smart Tint is a brand-new self-adhesive projection material that can transform just about any translucent surface into a 2-piece projection application. How cool is that? It can be used for commercial applications, such as stores and digital signage, but it also works in home settings as well. Besides windows, it also works on glass doors -- making that surface into an opaque projection screen that can also enable a little privacy, all while creating a fun home entertainment space. Smart Tint promises an immersive viewing experience indoors and outdoors, at the office, and in pretty much any public space. We have provided smart tint for thousands of home windows across the world. 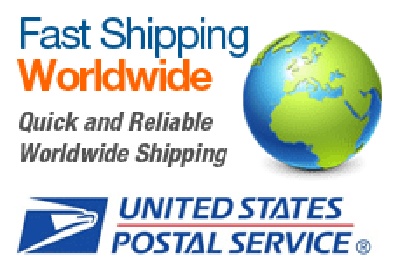 We take pride in our craftsmanship and we are dedicated to customer satisfaction. We know that great quality will speak for itself. Your homes biggests source of heat gain is from the windows. What if you could lower your rooms temperature by up to 15%? It would make an incredible differnce. Our films are great at lowering a rooms temperature and stopping ultraviolet rays from damaging flooring, furnature and artwork. Cool and protect your home from the sun today! This Switchable Film is widely applying for Interior glass, privacy applications. Especially, it is being used for Rear Screen as well. 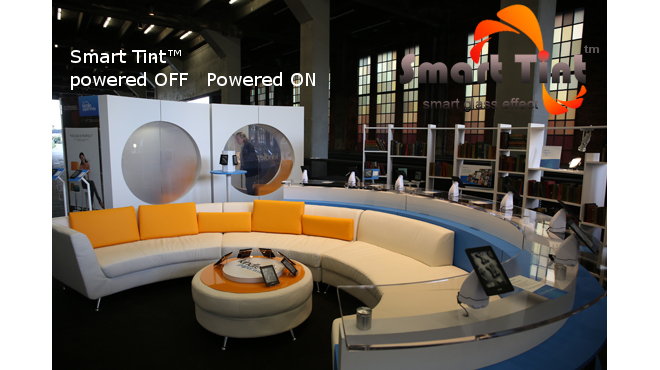 Smart Tint is made of two layers of transparent conductive film sandwiched with PDLC material. The film is then laminated between two pieces of glass. When electricity is applied to the film the liquid crystals line up and the window is clear. When the power is turned off, the liquid crystals return to their normal scattering positions and turn the glass from clear to translucent. The first window films were developed in the 1960s. They were (and still are) clear or tinted adhesive-backed products that allow viewing through the film with a minimum amount of distortion. The original films were dark and not all that transparent. Digital printing has added a whole new dimension to the world of window film. A variety of print media designed for use on windows has proliferated in our industry. There are films for mounting on the inside of glass, and films for mounting onto the outside of glass. There are films that are opaque, translucent or transparent, and films that are permanent or removable. And there are also perforated films which allow viewing of a graphic on once side, but are see-through on the other. Let’s review some of the basics. The sense of space in the office will be bad if they are separated by numbers of walls or frosted glasses, But if you use transparent glass, the business confidentiality cannot be protected. Smart Tint is designed to solve the above problem. During the leisure time, the smart tint can be switched to the full light transmittance state; and during the business meeting, just a click and the negotiation area will become opaque instantly. Smart Tint can also be used to become an interactive white board or projection screen for presentations. Smart Tint Window Films specializing in anti-fog window film systems! Our anti fog glass coatings can be applied to any relatively flat glass surface to provide privacy or optimum clarity if wanted. Smart Tint window films offer long-term performance as well as beautiful optical clarity. Not to mention projection, printability and anti-static properties. No matter who you are, where you are, or what your needs are, smart tint has the anti fog window film solution for your residential, refrigeration, automotive and fitness center needs! Smart Tint PDLC film (polymer dispersed liquid crystal film) which is a kind of high-tech product can switch from transparent to opaque instantaneously under electricity application. It is transparent when power on and it is opaque when power off. It can be regulated and adjusted the light transmittance pass through the film by electricity supply. The film is composed of PET film,ITO film,polymer and liquid crystal molecules. When the film is under off state, the randomly aligned liquid crystal molecules stay along on the walls of capsule, the reflection of liquid crystal molecules and polymer makes light disperses then it is opaque. While electricity supplied, these molecules arrange themselves in a specific direction then parallel light can pass through the film makes it transparent. Smart Tint has been developing innovative technologies for the glass industry for nearly a decade. This has predominantly been with our PDLC (Polymer Dispersed Liquid Crystal) technology, which has seen vast improvements and growth over the last 3 years. The products we produce using this technology are our Smart Tint and Smart Panels. Our products are manufactured using a very fine liquid crystal polymer which offers greater uniformity and superior visual display. Smart Tint provides a simple and cost effective alternative to Smart Glass technologies. It is manufactured with a self-adhesive cling layer on one side (peel and stick) which makes it easy to apply to both new and existing glass (no specialist installation equipment required). The smart tint can be used as a rear projector and its affection is far greater than projection curtain. Exhibition hall, cinema, business cupboard, underground marketplaces, boardroom, etc. Here is one way to install switchable smart film fast and easy. Simply order your smart glass film pre-custom cut to fit and pre-wired. Then use the self enclosed installation kit . smart Tint installation in corporate office building from Smart Tint on Vimeo. When the power supply is switched on, the rod shaped suspended particle molecules align, light passes through and the SPD SmartGlass panel clears. SPD SmartGlass protect from damaging UV when on or off. When the power supply is switched off the rod shaped suspended particle molecules are randomly oriented blocking light and the SPD SmartGlass becomes dark blocking up to 99.4% of light. SPD-SmartGlass can be manually or automatically “tuned” to precisely control the amount of light, glare and heat passing through a window. While glass is a favored product for use in building facades; glare, solar heat gain and UV exposure are problematic and can often make the use of glass impractical resulting in the need to invest in expensive solar shading devices. Glass facades using patented SPD solar control technology reduce the need for air conditioning during the summer months and heating during winter. Taking a stroll through your average city shopping precinct will see you bombarded with a plethora of advertising messages. Making their particular message cut through the visual noise can be a tough prospect for advertisers and plain old billboards and static signs just don’t seem to cut the mustard anymore. Those looking to grab people’s attention might want to take a look at Smart Tint, which can be laminated onto transparent glass or plastic to act as an eye-catching rear projection screen. PDLC Film is a well know high tech product which can switch from transparent to opaque instantaneously under electricity application. It is transparent when power on and opaque when power off. 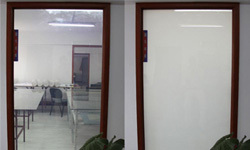 Mostly PDLC film is using for laminating switchable privacy glass or stick on float building glass surface, It has a widely use for building and construction area, Like window and doors, partitions, displays and projections etc. 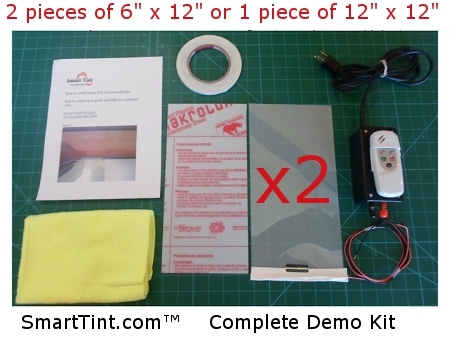 Smart Tint now provides interactive window tints. These films are used on existing glass structures and can be used for many applications. For instance, Smart Tint allows you to have complete privacy, clear affects, or can be projected onto. the material is also dimmable with the use of a dimmer system that Smart Tint also provides. This unique film technology provided by Smart Tint, transforms any glass into a high definition rear projection screen allowing you to display corporate presentations, TV images and videos. A truly innovative product making switchable glass technology accessible to everyone while giving your home or business the added WOW factor. Switchable Smart Window Film From Smart Tint.